In the first playoff game for the San Francisco 49ers since 2002, fans left knowing that what they had just seen was one of the best football games in history. A home game for the 49ers, they started off strong against the New Orleans Saints, but the Saints quickly answered back. With the Saints up 24-23 with four minutes left, Alex Smith showed the world that he was worth the #1 overall pick in the 2005 NFL Draft. 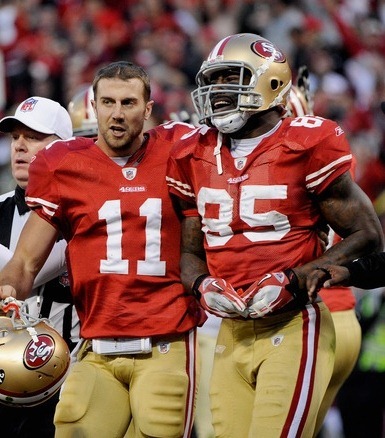 After dealing with criticism as he struggled to adapt to the NFL system as he went through a new Offensive Coordinator every year, Smith proved that with Coach Harbaugh he has arrived by leading San Francisco in an amazing comeback that ended with a touchdown pass to Vernon Davis with just seconds left on the clock to give the 49ers a ticket to the NFC Championship game. Later on Saturday, the New England Patriots, who are often the favorites to make it to the Super Bowl, stuffed Tim Tebow and the Denver Broncos. The Patriots seemed to score on every possession. At the end of the game, the Patriots won by a score of 45-10. Tom Brady threw for a playoff record tying 6 touchdown passes. Sunday morning, the Houston Texans faced the Baltimore Ravens to see who would meet the Patriots in the AFC Championship game. After leading by a field goal to start the game, the Texans would end up trying to catch up to the Ravens for the remaining 55 minutes of gameplay. Despite holding Ray Rice to just 60 yards and Arian Foster rushing for 132 yards himself, the 3 interceptions thrown by TJ Yates were too much for the Texans to overcome as they lost 20-13. The Sunday afternoon game saw arguably the best team in the league this year and the defending Super Bowl Champions, the Green Bay Packers, take on the New York Giants. The Giants shocked the Packers by taking a lead in the second quarter and never looking back. Eli Manning put up a fantastic performance while the Giants defense kept Aaron Rodgers, who is likely to be named the MVP this season, at bay, barely allowing 50% completion of passes. The Giants ended up stunning the Packers with a final score of 37-20. The AFC Championship will be the Baltimore Ravens at the New England Patriots. And the NFC Championship will be the New York Giants at the San Francisco 49ers.